Tonight on NBC their hit reality talent show AMERICA’S GOT TALENT returns for the eighteenth episode in its ninth season and on tonight’s show the semi-final round kicks off with 12 of the Top 24 acts performing. On the last episode, the top 24 acts were revealed in a results show. America’s votes are in, and five acts from the previous night’s performance show moved on to the semi-finals. Smoothini made it through, he did a small magic trick and he never expected to go through; he truly felt he did not do enough and was very grateful for this next shot to prove it to America. Howie said he was very happy that he made it through and the point was, that from where he was sitting, he was amazed by the act and he knew America at home would enjoy it. Did you watch the last episode? If you missed it we have a full and detailed recap, right here for you. On tonight’s show, twelve of the Top 24 acts perform live for the chance to win the $1 million prize and become the most talented act in America. 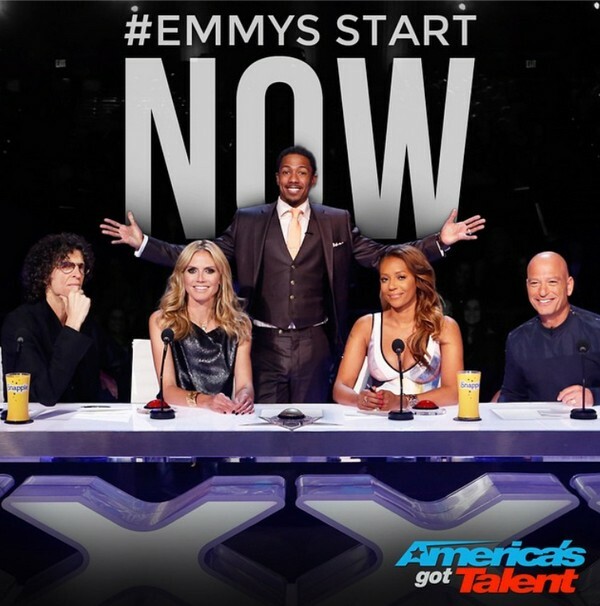 Starring celebrity judges Howie Mandel, Mel B, Heidi Klum and Howard Stern. Hosted by Nick Cannon. RECAP: We take a look at Heidi’s wild card, it’s a group that has tons of energy and brought back Flight Crew Jump Rope; they were sad to be kicked off before and want to prove to America that they deserve to be there and that Heidi made the right choice in choosing them. Heidi says that they made her so proud, last time America didn’t vote for them and believes this time they have it in the bag; they did such an awesome job. Mel B says that it is the best way to kick off the show tonight, she loved how they worked so well together. Howie says what they do is fantastic, though doesn’t feel like it was that impressive to him. Howard says he feels bad about them, they worked so well and says that what they do is very similar each time; America doesn’t like that they seems more like a background act. Next up is Mara Justine, she was so surprised to get to move on from the last round; she just started crying and was so happy for it to be real. She is so excited about all the support from her family and friends; she feels like this is the opportunity of a life time to change the lives of her family. Howie says she brought him to stand up in the middle of her song, it was so powerful and can’t believe how at only 12 years old she sings so well. Howard says that she redeemed herself this week, she is a freak of nature in the best way possible; she has such a powerful voice for such a young girl. Mel B says she is an amazing singer and is proud of her tonight, Heidi says that she just had a break out performance; she saw her spread her wings fly right into the finals. Mel B brought back an act that was talented and original; she brought back Bad Boys of Ballet; she absolutely loves these dancers. They were very disappointed and upset, Mel B could not believe they didn’t go through and made them so happy to save them. Howard says that says that the act had a build up that really didn’t wow him, they are great dancers and they just didn’t impress him at all. Heidi says they have a unique concept to ballet and believes they are great dancers. Howie agrees, he knows that without someone is going to use them as dancers; they are amazing and believes they are not a million dollar act though. Next up is Paul Leti, when he was in the army he never imagined he’d be here performing on such an amazing stage; he could not ask for anymore to make him happy. He walks around New York smiling, he has a tons of supporters and also other men who have served in the military; he was prepared to not come back home when he was gone. He is thankful to make it back and that’s why he’s giving this competition all he has. Heidi says that this was not his best performance, she loves him and knows he’s singing his heart out but it wasn’t enough for her. Mel B says that it was a little off, it was like he was doubting himself in his voice; he wasn’t in the pocket. Howie says that Mara did a lot better than him. Howard says that he’s a hero and believes his act just wasn’t good enough. Howie’s wild card is Mike Super and Desmond, he was destroyed inside and felt horrible going home; he was hoping he’d get a second chance. He was so excited when Howie called, Howard judged Desmond and decided to take a magic approach this time. Howie says he loved this act, it was such a great illusion and shows that he is purely worthy to have his own show in Vegas. Mel B is glad he’s back and loved his act; it left her thinking of how he did that. Howard says that he’s glad Mike listened to him, this time he came out and did a great magic trick; he loved it. Heidi says this trick was out of the box, it was something different and it worked really well. Next up is Andrey Moraru, he believes balancing is a very hard thing to master; you have to be one with your body and have incredible focus; he’s a solitary person and feels like his balancing make him feel like he’s not alone anymore. Next up is Miguel Dakota, music has always been his dream and being in the semi-finals is something he’d never imagine; he can’t believe how he was performing on stage and then back home working and cutting down trees. He’s never thought his life would be like this, he’s ready for this performance and is working so hard to support his family doing what he loves. Howard says that he has the hair, the look and that every woman goes wild for him; he’s everything right though what he’s missing for him is that he feels the song was very boring. Heidi says that she feels that America’s new heart throb has arrived. Howie says that Howard is totally wrong, he’s got a great chance at winning the million dollars. Mel B says that he has that special something, he has star quality and believes he can truly become one. Next up is an act who’s only been together for a couple of months Sons of Serrendip, they all discovered music at a young age and by mistake; they completely found a passion for it. They are a happy accident and are happy to be together on their journey. Heidi says that they sang so beautiful, she believes they got nothing to worry about. Mel B says she loves what they did, they took a well known song and made it their own; it was beautiful and solid. Howie says that they are musically the most talented group they have, they have the most talent in the show. Howard says that is a singer, this man connects to the song perfectly; their name is a little weird though but thinks they are amazing. Next up is David and Leeman, going back to work for the two was a wake up call; it made them realize that they don’t want to have their current jobs and want to do perform for a living. They made their trick for Heidi to get her out of her seat, they want to be pushed into the finals. Mel B was so surprised with how entertaining they are, Howie says he likes it. Howard says it was interesting and loves their delivery, he’s seen the trick before though they make it so engaging and have the topic going. Heidi syas that it’s funny how they keep coming back forth, she liked it a lot. Dan Naturman and didn’t believe he’d be going on to the next round of the show, since he made it through he has more confidence; he’s even got on a few dates. He hopes he can be the first comedian to win the competition. Heidi says that it is amazing how he almost offended many people, Mel B says she feel like she liked the end of the act and hopes America votes for him. Howie says that they are breaking it down to much, he feels like people should go Naturman and he’s got the gift of laughter. Howard says that you have to buy into who he is, he’s a capable comic and he knows how to keep things moving; he always looks forward he’s coming on. Next up is Ariel Animations, she gets lost in the story and moment of her act; she is so happy she gets to explore everything that happens in her imagination. Working on this piece takes a lot of work, she is putting a ton of effort to make something entirely new and wants to make the kids she teaches proud. Mel B says that she looks back to the last time they saw her, it was slow tonight and the delivery was very disjointed; she feels like it was a bit disappointing. Heidi says that every time she stepped up but this time it was like a step back. Howard says Howard says that she is amazing and that the act is fantastic. Howie says that as an artist you have to experience, he felt there was less action on screen though still very amazing. Last up tonight is Emily West, she has no plan B whatsoever; this is all she wants to do in her life. She absolutely loves singing and it’s her life time dream, it’s something she wants to do for a living. She has had moments of self doubt, but now feels like she can see her dream. Heidi says that she has a special Hollywood glamour style and loves her voice; she thinks she is fantastic. Mel B loved this performance, it was bigger and better. Howie says that two words come to mind, seasons and iconic; it was wonderful. Howard says she is a star without a doubt.